Exhibition runs June 28 – September 8, 2012. Opening reception on Thursday, June 28, 5-7 pm. RoxyAnn Winery is generously donating and pouring at the reception. 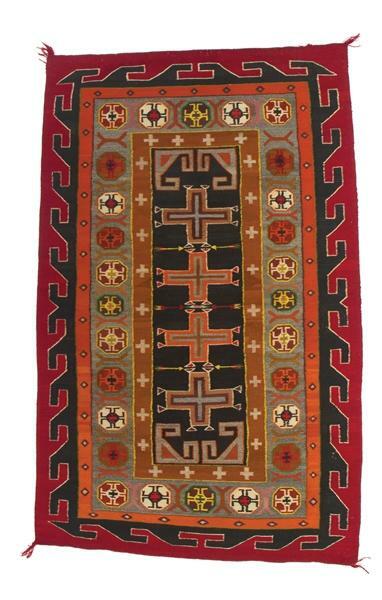 Over three-dozen rugs woven by Navajo weavers between 1910 -1950, are on loan from the Ruth K. Bellikove Collection. Named for the trading post in NE Arizona where the weavers sold their work and shopped for food and sundries, Teec Nos Pos rugs are characterized by complex multiple borders. Often long and narrow, the rugs tend to be bold with outlined geometric elements. 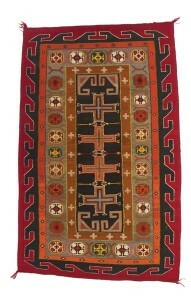 Various influences are visible in the Teec Nos Pos designs, from Oriental carpets to Plains Indian beadwork. Though no one is certain how these influences came about, the weavings were designed to tempt both the tourist and home furnishing markets. “My goal in painting is to create an experience you feel as opposed to a composition you read”. And that experience is one of pulsating optical vibration in serial works of Portland-based artist, Eva Lake. Constructed of alternating lines and color, and changes in value and hue, Lake\’s subtle blending of paint keeps the viewer engaged with the entire canvas or canvases. Often organized in multiple groupings, Lake’s linear works suggest industrial uniformity but upon close inspection reveal facile freehand work.